Home › Advice › Emergency vehicle sirens: how loud are they and what type of sirens are there? Emergency vehicle sirens: how loud are they and what type of sirens are there? Sirens are a universal warning device understood by all. They are used on the road by police, fire and ambulance emergency services to make other road users aware that they are approaching. Sirens have to be loud because people are often daydreaming, listening to music, have got the windows up or have a helmet on. In the case of heavy vehicles, the engine and road noise can sometimes be quite loud. Secondly, a siren has to indicate a direction it’s approaching from, which is done by varying the pitch; if the siren just had one constant tone it would be much more difficult to tell which direction it was coming from. New Zealand has generally adopted the American-style wail, yelp or phaser sirens as opposed to the British two-tone pneumatic horn (although not in all cases). Wail, yelp and phaser refer to how quickly the sound’s pitch moves up and down, with phaser being the fastest. The slow wail is easy to hear but is much more difficult to locate than the faster phaser and therefore emergency vehicles will sometimes switch to the yelp or phaser as they approach an intersection. An alternative sound is a kind of digital horn which is even more easy to locate because it contains a broad range of frequencies. However, we’re most attuned to the two most common types of siren and using any other type of siren doesn’t bring the same association of ’emergency’ when people hear it. 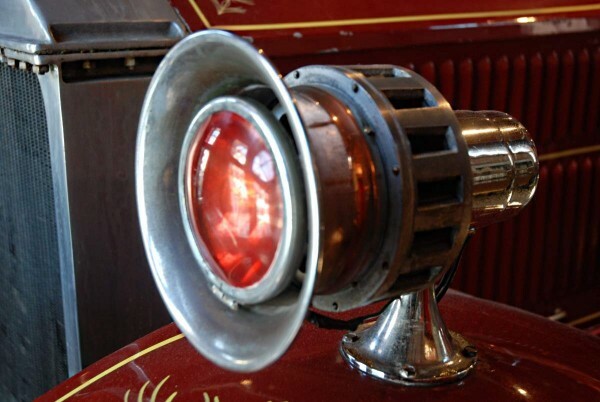 While original British sirens back in the day used to consist of two horns that alternated, and antique American sirens were either hand-wound or looked like the image below (once they became electric), new sirens use one powerful speaker (or two speakers playing the same sound). Sirens operate in a frequency range (pitch) where they are best heard by humans: 1-3kHz (i.e. 1000-3000 oscillations per second). Our ears are most sensitive in this range, and this means that the siren doesn’t have to produce as much power to make itself heard. The only problem is that our ears struggle to determine where sounds are coming from between 2-4kHz. 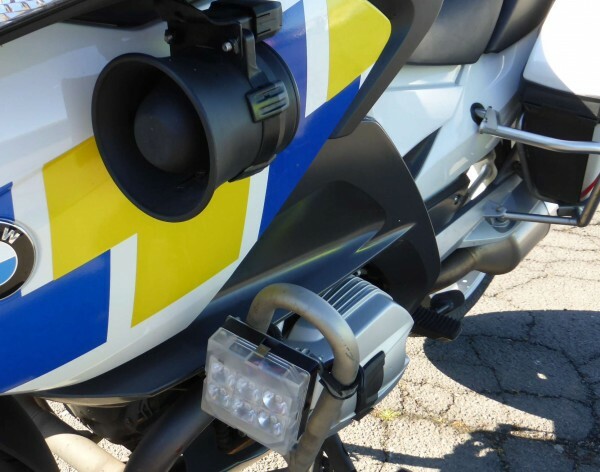 The image below is a New Zealand police BMW’s siren which is located on the fairing just below the handlebars. There’s a matching one on the other side. Inside the siren there’s a speaker driver which produces the sound. Simplistically, the speaker driver faces backwards and the sound is amplified forwards by the shape of the flared horn. How loud are emergency sirens? We measure sound in decibels, and for every 10dB increase, it sounds twice as loud. Therefore 50dB is twice as loud (subjectively) as 40dB, and 60dB is twice as loud as 50dB, therefore 60dB is four times louder (twice times twice) than 40dB. Those volume levels can add up! The sirens emergency services use are around 110dB. 110dB is 128 times louder than 40dB (40dB is the sound level in a quiet library). But, adding two sirens together doesn’t make them add up to 120dB because doubling the power only increases the volume by 3dB, which is not that noticeable, and certainly not noticeable at such a high volume as 110dB. Long term use of the siren can damage the hearing of any vehicle occupants. Even though it won’t be 110dB in the car or truck, it’s still loud. And for motorcycle-based emergency response personnel, well, they often wear earplugs because it is loud (and the bikes are often loud, too). Getting the actual volume right is a compromise: it should be loud enough to alert people from far enough away, but not so loud as to damage the hearing of the vehicle occupants and pedestrians. How can we tell where siren sounds are coming from? Interaural amplitude difference: sound on one side of your head will be louder in the ear that’s on that side, compared to the ear on the other side. This doesn’t work if the sound is directly in front of, behind or above you. Interaural phase difference: sound on one side of your head hits your ear, and by the time it’s reached the other side of your head, the phase is different. Phase describes at what point the waveform reaches your ear. Again, this doesn’t work if the sound is located on the plane from directly in front to directly behind you. Interaural time difference: sound on one side of your head hits the closest ear first. Even though the time difference is minute, our brains can decode that information. Again, if the sound is in the plane from directly in front to directly behind, the sound arrives at the ears at the same time, so this mechanism can’t be used. In the three interaural measurements (which really just measure the difference between the ears), if the siren is approaching from behind you it can sometimes sound like it’s in front of you and vice versa. Haas or precedence effect: this is the most useful when sounds are in front or behind you. There’s always echo with sound because sound bounces off objects. Some blind humans have learned to use this to enable them to navigate the world – check out this TED talk by Daniel Kish. In fact, it’s all around you, but our brains filter it out and just use the direct sound. Because the echoes are coming from all over the place, the brain can use them to help figure out which direction the sound is coming from. The only time this can confuse us is if we are only hearing echoes rather than direct sound, e.g. the emergency vehicle is located in a side street and the first sounds to reach you are multiple echoes from many buildings. If you hear emergency vehicles coming, here’s what to do.